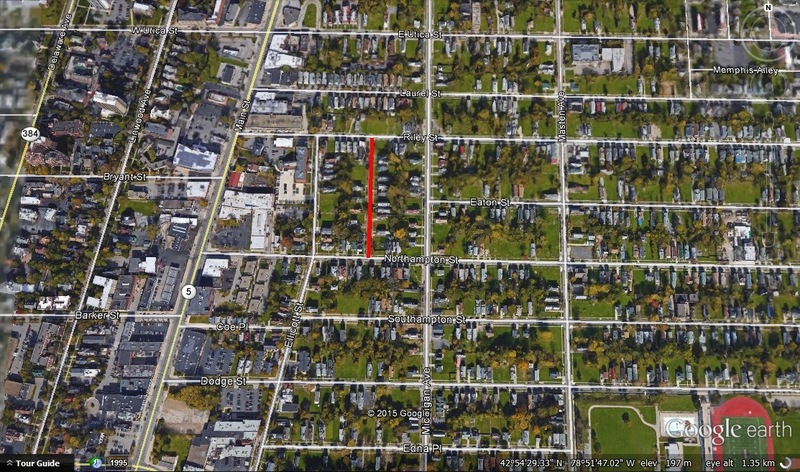 Holland Place is a one block long street in the Masten Park neighborhood on the east side of Buffalo, running between Riley Street and Northhampton Street. The street is named after Nelson Holland. Nelson Holland was born in Belchertown, Massachusetts in 1829. The Holland family was a pioneer American family, John Holland had settled in Massachusetts in 1633. Seven years after Nelson was born, his father brought the family to Western New York and bought a farm in Springville, New York. Nelson attended rural schools and the Springville Academy (now the Griffith Institute). In 1850, Nelson Holland moved to Buffalo to work for his uncle, Selim Sears, who at the time was operating a mill in Michigan. Nelson later purchased a portion of a saw mill, which stood where the Michigan Central Railroad station is (look this up). He then purchased 4,000 acres of pine lands in Michigan. In 1855, Mr. Holland purchased a mill in St. Clair, Michigan. In 1864, Mr. Holland purchased 4,000 acres in Buffalo and came to Buffalo to look after his purchase, leaving his St. Clair mill in the hands of his brother Luther. Mr. Nelson purchased interests in many mills and lands, stretching into Canada. He owned lands stretching from Buffalo to Texas. Mr. Holland’s holdings held firm through the ups and downs of the lumber industry, and survived the panics of 1857, 1873 and 1893. He had controlling stakes in as many as 4 different lumber companies at the same time. Even after 40 years in the business, Mr. Holland was said to “retain much of his old-time vigor, ambition and force with which to carry forth plans of future operations”. In 1877, the Buffalo firm of Holland, Graves and Montgomery was organized. They handled more than 500,000,000 feet of pine lumber. Mr. Holland was considered to be a master in the art of manipulating pine forests to get product into marketable form. It was also said that he had probably cut and consumed more pine lumber than any other man. 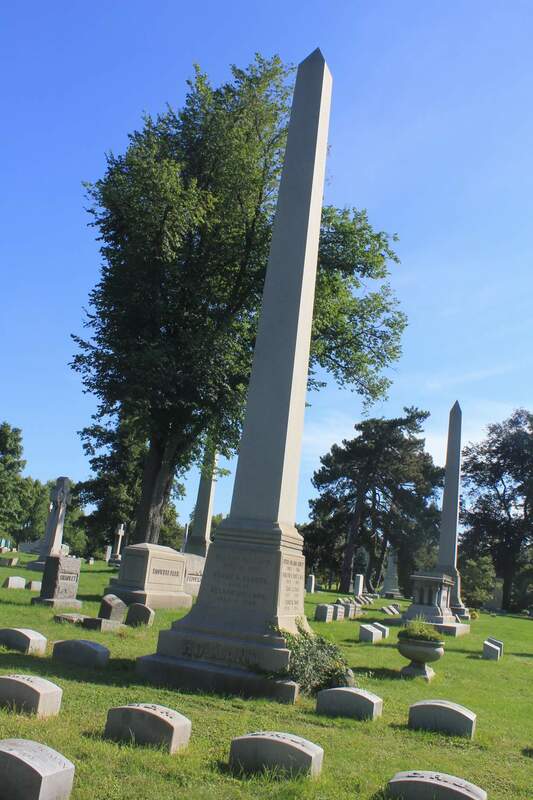 Mr. Holland was also prominent in lake transportation interests and was proprietor of the Buffalo Standard Radiator Company, which made radiators. He was a member of North Presbyterian Church and served as President of its Board of Trustees, and then later became a member of Westminster Presbyterian Church. Mr. Holland married Susan Ann Clark of Silver Creek in June 1857. They had four children – Jessie Clark, Helen Lee, Grace and Nelson Clark. Their son Nelson II took over the lumber business from his father. The family lived in a large brick home with sandstone trimmings on the northwest corner of Delaware and Bryant. Mr. Holland died in 1896 and is buried in Forest Lawn Cemetery. Our County and its people: A descriptive work on Erie County, New York. Edited by: Truman C. White. The Boston History Company, Publishers: 1898. Memorial and Family History of Erie County, New York. The Genealogical Publishing Company: Buffalo: 1906. 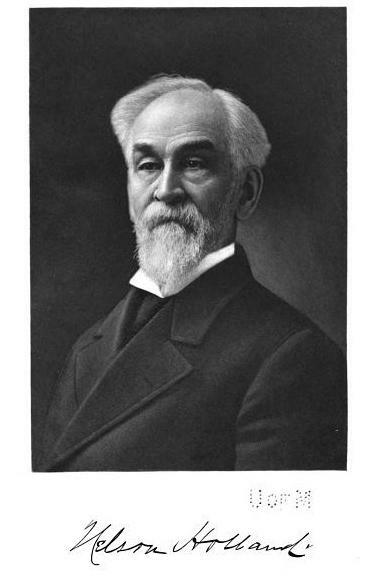 Larned, J.N. A History of Buffalo: Delineating the Evolution of the City. The Progress of the Empire State Company: New York. 1911. Is this the same Holland family from the Holland land Company? Nope. The Holland Land Company was named that because it was a bunch of dutch investors, so it’s named Holland after the country the Netherlands. Any info yet about Zollzrs street? Nelson Holland is my great great grandfather. His granddaughter Mary Holland is my grandmother. Wow. The same Mary Holland who runs the Buffalo Religious Arts Center? No. My grandmother lived in FL and MI and was first Mary Holland Low by marriage and then Mary Holland Ford. She died in 2005 at age 98 three months shy of her 99 birthday.